Motor development is a crucial factor in a child’s physical, emotional, academic and overall success. Joye Newman, Director of Kids Moving Co., and Carol Kranowitz co-authored this book to give parents, teachers, and other professionals the tools to give every child a head start and a leg up. 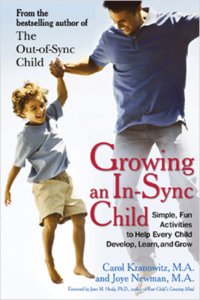 The In-Sync Program includes 60 adaptable and fun activities to enhance your child’s development, in just minutes a day.